The Cass Freight Index is based on “more than $26 billion” in annual freight transactions by “hundreds of large shippers,” regardless of mode of transportation, including by truck and rail. It does not cover bulk commodities, such as oil and coal and thus is not impacted by the collapsing oil and coal shipments. The index is focused on consumer packaged goods, food, automotive, chemical, OEM, heavy equipment, and retail. In a similar vein, the Association of American Railroads reported last week that loads of containers and trailers fell 7.5% in April year-over-year. “Intermodal” is a direct competitor to trucking. Combined, they’re a measure of the goods-based economy. 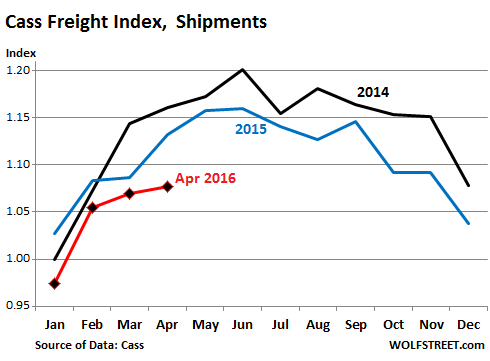 May is usually a relatively strong month for freight shipments, but given the high inventories with ever slower turnover rates and the decline in new production orders, May could be another soft month. These inventories are a doozie. 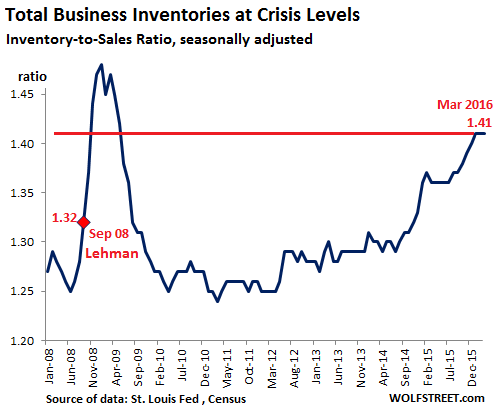 Total business inventories have ballooned since late 2014, even as business sales have declined. On Friday, the Commerce Department reported the March installment of that story: total business sales (adjusted for seasonal and trading-day differences but not for price changes) fell once again, this time by 1.7% from a year ago; and business inventories rose by 1.5% from a year ago. With sales down and inventories very high, businesses are trimming their orders to bring inventories back in line, and this is impacting the transportation industry. Due to falling volume and “very soft rates,” as the report puts it, shippers have spent 8.3% less in April than a year ago, the lowest April spend since 2011. 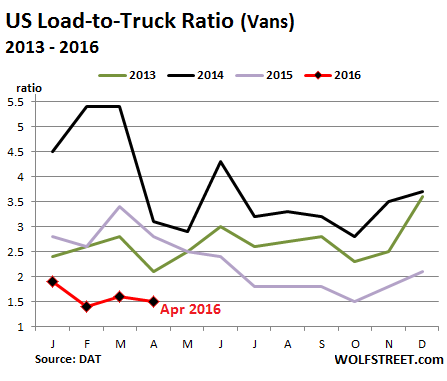 “With ample capacity available across the modes, competition for loads is holding rates down,” the report explains. and poor export figures due to both the strength of the U.S. dollar and a decline in worldwide demand. Eyes are on the Chinese economy, which has been extremely unstable and can have a big effect on world economies if it continues to falter. Based on the trends of many economic indicators, it appears the economy may get worse before it gets better. This type of transportation data shines some light on the goods-based economy in the US, and by extension, in the world: the goods-based economy is hurting – and there are no signs it’s getting any better anytime soon.